The e.l.f. 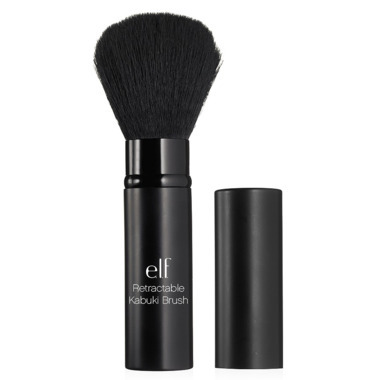 Retractable Kabuki Brush is the perfect size brush for applying powder, bronzer, or blush on the go! The soft bristles apply and blend product flawlessly for buildable coverage and the retractable head allows for controlled use and mess-free storage. The Taklon bristles are vegan-friendly and easy to clean. How To Use: Remove cap and slide down base to expose brush. Sweep onto face and blend color as needed. Replace the cap for mess-free, on-the-go touch-ups. Excellent quality and perfect for travel. Bristles are very soft, and they do not get caught in the tube when retracting or being pushed out. Really like this brush! Needed a brush to keep in my bag for powder touch-ups and already love elf's black brushes (used to be called the studio line) so I bought this. It doesn't shed, works well, and is very convenient. I love elf they're cruelty-free and affordable. An excellent retractable brush, very soft and actually doesn't shed! Great for travel, and doesn't shed. A good retractable brush, soft and no shedding. It is in my carry makeup bag and I use it for touch ups when I am out. Works great for a controlled blush application, and the retractable head is really handy for travel. Although the bristle quality isn't extraordinary, I really appreciate that they're vegan. Great multi-use brush especially for travel or just to keep dust out. The bristles are not the highest quality but decently soft. Good value for the price. Can adjust how much you retract the brush to change the density for different applications. For example face powder verses blush.